After this dramatic introduction I can start from the beginning the tale of what was meant to be a half-day excursion with no particular ambitions. 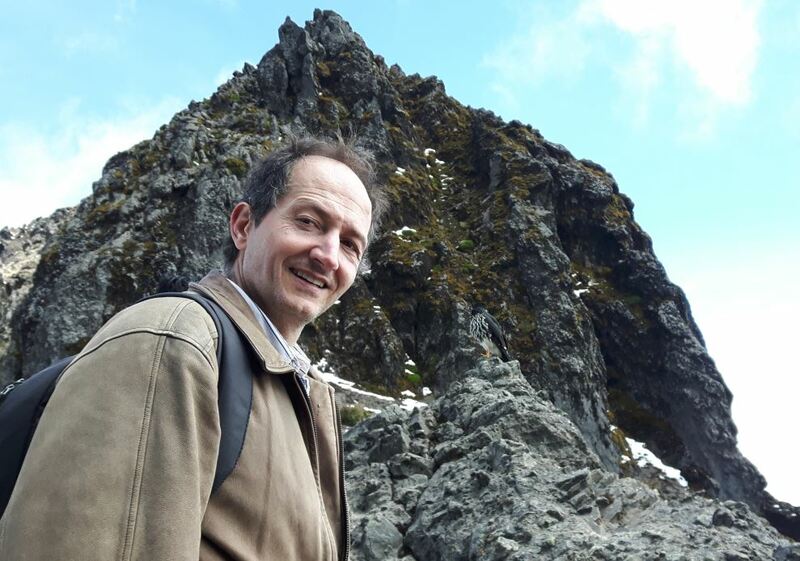 I am spending a week in Quito, Ecuador, where I have been lecturing graduate students in astro-particle physics on the physics of the LHC and the results of the CMS detector. The school is the 7th edition of the “Cosmic Ray and Astroparticle Physics” in Latin America; previous editions have taken place in Bolivia and Mexico. Ecuador is a nice little country cut in the middle by the equator – so the sun here rises exactly at 6AM, culminates at the zenith, and sets exactly at 6PM. The climate is quite stable, although precipitations have a minimum in August. In any case the forecast is impossible here, as the mountainous region has very irregular patterns of cloud formation. My jetlag woke me up quite early on Sunday morning, and after spending a couple of hours on polishing my lecture slides, I decided to have a shot at the Teleferiqo, a cable car that brings on a nearby mountain from which a beautiful sight of the city can be had on good days. 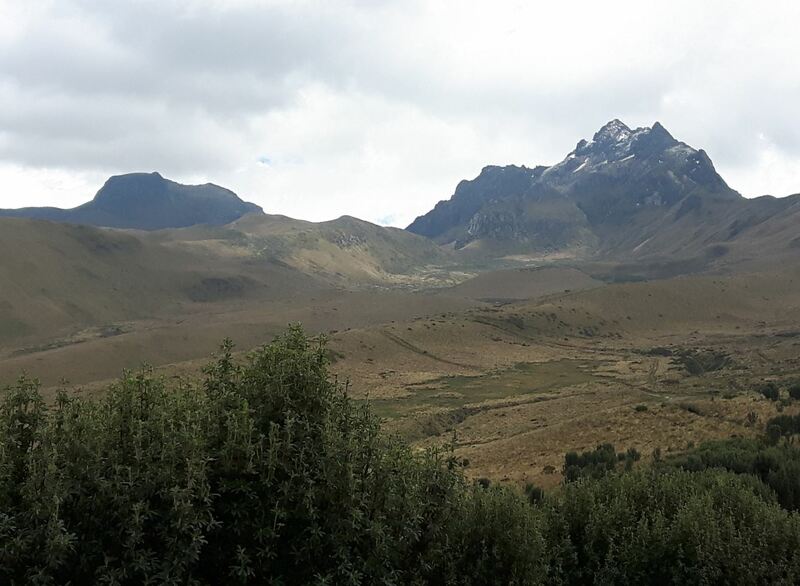 Quito stands at an altitude of 2800 meters above sea level, and the high point of the Teleferiqo is at about 3900. High altitude! For a guy with a craving for mountain adventures like me, this was a call I could not miss. So at 11AM I finally jumped on a cab and got to the boarding place, where I had to wait in line for over half an hour. Cursing silently for not having gotten there earlier, I finally got to the top at noon. https://amva4newphysics.files.wordpress.com/2017/08/pichincha1.jpg?w=150 150w, https://amva4newphysics.files.wordpress.com/2017/08/pichincha1.jpg?w=300 300w, https://amva4newphysics.files.wordpress.com/2017/08/pichincha1.jpg?w=768 768w, https://amva4newphysics.files.wordpress.com/2017/08/pichincha1.jpg?w=1024 1024w, https://amva4newphysics.files.wordpress.com/2017/08/pichincha1.jpg 1337w" sizes=" 736px) 100vw, 736px" />Pichincha (left) and Cumbre Rucu (right) from the Teleferiqo. The ridge approaching Cumbre Rucu is visible on the right. As for my backpack, it was a very small one, and it contained a k-way, a sweater, a thermic t-shirt, a packet of crackers, and sunglasses. Nothing else. Not the kind of equipment for a trek at over 4000 meters of altitude, but I thought I would walk for only a bit, maximum two hours, and then turn my back to wherever I’d got and return to safety. I thought this would minimize my risks. Already at the lower station of the Teleferiqo, while waiting in line, I had had the occasion to read advices on how to behave. This included carrying stuff with me which I did not have (medical equipment, a knife, food), not trek alone as I was going to do, and be informed on the weather forecast, which I wasn’t, but was useless anyway. Interestingly, the note also added advice on what to do if caught in a storm: avoid it at all costs, but if you do, lay down face down to minimize risks of lightning strikes, and do not stray away from the path if there is low visibility. As I kept walking I felt that proceeding at my usual speed was somehow harder than usual. Of course – only 30 hours before I had been at zero meters above sea level, in Venice, and here the lack of oxygen and the altitude were conspiring to make things challenging. I felt pain on my ears, but I insisted on keeping my usual pace, although my heartbeat kept peaking at 130-150 per minute, decreased as I slowed down a bit, and then got back there in less than five minutes. I am bradycardiac, with an average rest heartbeat of about 52, and I believe I will hardly die of a heart attack while exercising, so I was not too concerned by the fast heartbeat, but that gave me something to worry about for a while during my ascent. In the meantime, I was consistently overtaking all the other trekkers. “Just as in the old days”, I thought to myself. As I kept going, I stopped to take pictures of the interesting flora and of the landscape. 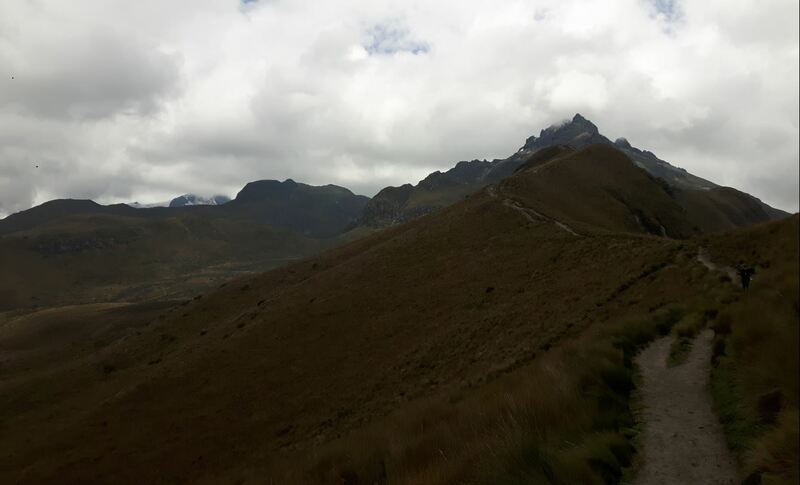 The peak was getting closer – I later learned it is the “Cumbre Rucu”, a 4750m volcano that stands on the right of the Pichincha, and is closer to the end station of the Teleferiqo. I was starting to entertain the idea of getting to the top of it, but I had no idea of whether it was possible, and whether the path I was following was going there or what. I just enjoyed the trek, which soon became a bit more challenging. 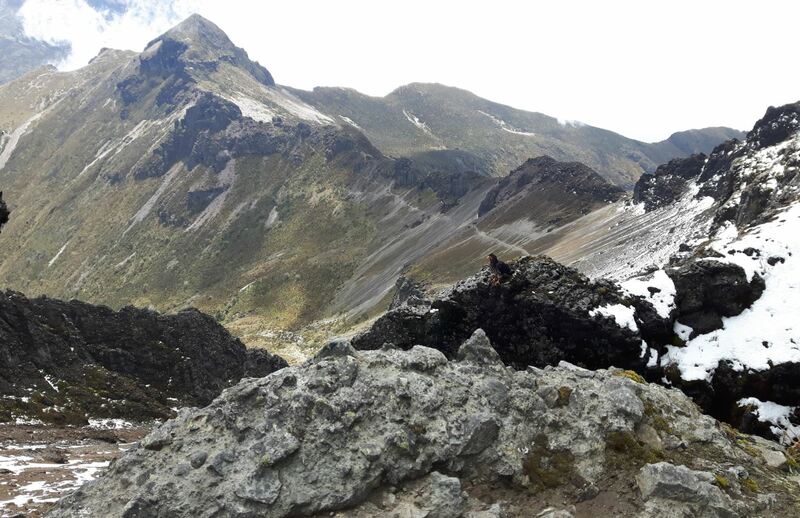 After reaching the edge of the rock which constituted the real peak of Cumbre Rucu, the path curves on the right, coasting its flank while rising steadily; then it makes a left turn and points straight to the top. Already on the flank there are a couple of passages where you can get discouraged from continuing if you’re not accustomed to having your hands on the rock, as you have to shortly climb 5-10 meters up to overtake rocky interruptions of the otherwise simple path. On the first one I would meet, upon returning from the excursion, a couple of Americans who were unsure of what to do – he had a broken finger and seemed unable to climb confidently. I now hope they did not proceed, as I will explain later. Long story short, just before 2PM I reached the high point of the path, a saddle between two rocks. 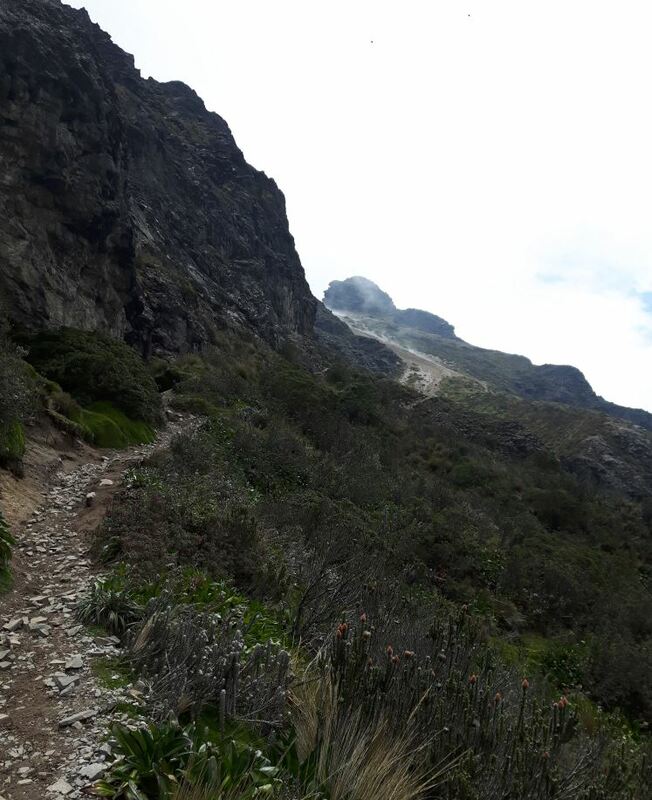 From there, a short climb of 50 more meters would bring me to the real top of Cumbre Rucu, but at that point I felt a bit exhausted, my shoes were not really meant for rock climbing, and I started to worry about my physical conditions on the next lecture day. So I decided to stick to the original plan – I was starting to get worried about making it back to the Teleferiqo before some nasty clouds could interfere. https://amva4newphysics.files.wordpress.com/2017/08/pichincha5.jpg?w=150 150w, https://amva4newphysics.files.wordpress.com/2017/08/pichincha5.jpg?w=300 300w, https://amva4newphysics.files.wordpress.com/2017/08/pichincha5.jpg?w=768 768w, https://amva4newphysics.files.wordpress.com/2017/08/pichincha5.jpg?w=1024 1024w, https://amva4newphysics.files.wordpress.com/2017/08/pichincha5.jpg 1320w" sizes=" 736px) 100vw, 736px" />The valley and the Pichincha from the Cumbre Rucu. 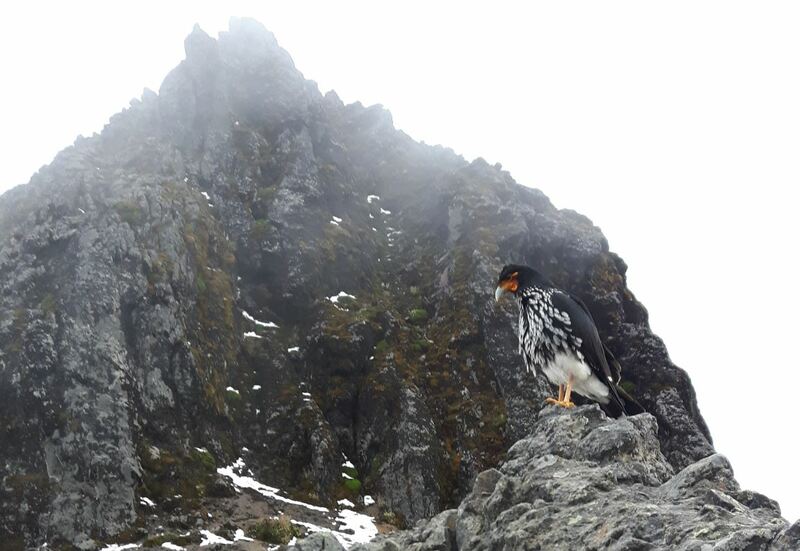 Besides, I could be proud of myself: I had made it to over 4600 meters of altitude, I could enjoy a wonderful landscape of the other side of the mountain, there was snow all around me, and there it came, a huge bird, who landed two meters away from me! I later learned it was a Caracara. Beautiful animal, and not scared in the least of my presence. I managed to take a few pictures of the bird, and fed it with a cracker. Soon I decided it was time to return. I blitzed down the steep, sandy slope I had come from, and soon reached the end of the more complicated part of the trek, where the long ridge starts. I was overtaking a few groups of other trekkers, most of which were also going back. The weather did not look any longer promising: a dark cloud could be seen above the city of Quito below me. I was proceeding fast, but as I heard the first thunder, and saw the bolt still far in the distance, I started to run. Now, running is never a good idea in the mountains, for several reasons; the more so if you’re 51 years old, and if you feel quite tired from three hours of high-pace trek. But I compared the various dangers and I decided that what I had to absolutely avoid was to be stuck on a ridge with a storm coming. As the path keeps on the edge of the slope, you are a very easy target for any electric discharge. Not good. So run, legs, run. My heartbeat was no slower now than during my ascent, and I had to stop at times. I was making fast progress, but the distance to the first shelter was still of two miles, and the storm was getting closer faster than I hoped. Rain soon started, and I stopped to put on the raincoat, turn off the cellphone, and get back to run. It took a minute, and it turned into hail. Small, and then thicker. The bigger ones were about half inch in diameter, and they hurt when they hit me. In the meantime, visibility was decreasing to less than 10 meters, and the temperature was dropping like a stone. At first I tried to find shelter amidst thick grass -there was nothing better around, laying down with my face on the ground. This did help for a bit, but I started to question whether it was the right idea to stay put, drenched and cold, while the storm was intensifying. Soon a group of trekkers passed by me, and I decided to go back to the original plan. 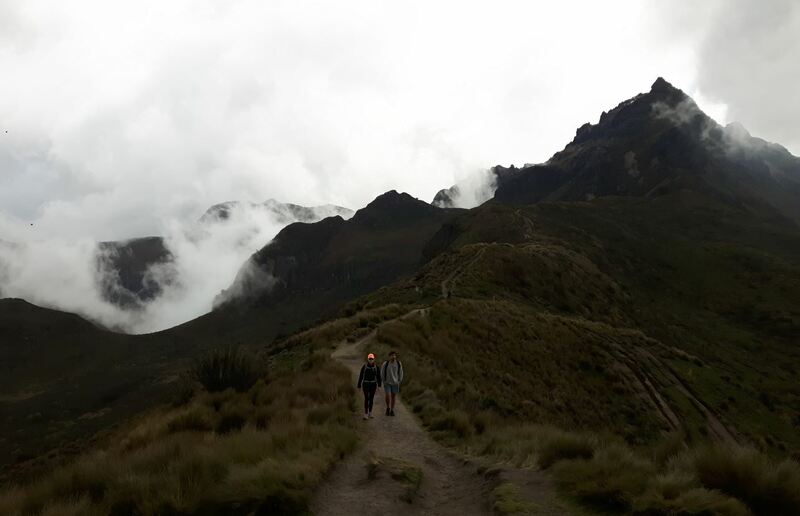 I kept running fast, and soon overtook the group of other trekkers with some difficulty. I wanted to stay far away from them – one of them might have some nice metallic target sticking out of their backpacks, and I did not want to start a conversation on the opportunity of throwing away equipment for safety. The overtaking operation cost me a significant effort, and I started to feel really exhausted. I was now running sideways, such that the hail, which was coming from my left pushed by strong winds, would hit my back and not my face. All of this was taxing for my physical strength, which was decreasing quickly. Also, water was flooding the trek now, and running was becoming even more treacherous. But I wanted to get the hell out of there. The first close lightning strikes made it even more clear that I had to rush. And then a strong one hit just behind my back, maybe 100 meters away from me. I did not feel anything except the thunder, and decided it was better to not turn back – besides, I could barely see anything. So I continued to run. Finally, I got to a shelter – it was a place where locals were grilling some meat. Wet from head to toe, completely exhausted, I stood there for a few minutes. Then came the guys whom I had overtaken last, before the lightning stroke close to me. And they were shocked. Some of them cried. A guy explained that he had felt the electric discharge going down from his head to his toes, others confirmed having felt the same. Some members of their group were missing, and those around me looked disconcerted. My understanding of Spanish is not so good, but I did understand that they feared for the life of those who were still missing. As the weather was clearing, and I was freezing and exhausted, I decided I was of no use there, and quickly covered the remaining 15 minutes of path to the Teleferiqo. A long queue awaited me, but I saw a sign which said “elderly people / respiratory problems / women with small children”. I felt that the first two adjectives perfectly described my current state! It was a sign inviting me to overtake the queue. I did not hesitate and presented myself in front of the operator, with a face that did not need any explanation. “Solo?” “Si, soy solo”. And down I went with the next car. To be fair, I should say that the Teleferiqo does have two queues. Cars host six people, but most of the visitors are in groups and they don’t want to split in different cars, so when the personnel sees people traveling alone they invite them to sneak in the empty seats of a cabin, overtaking the rest of the customers. Back to my hotel room I plunged in the bathtub, where I remained for half an hour. Then I slowly recovered. On the next morning, I was feeling great again, not even pain on the muscles of the legs: a sign that I am in good physical shape indeed. Ready for three straight hours of lectures on the LHC, CMS, and collider physics! So, that is the story. As you can see, I maybe did not really risk my life, or maybe I truly did. For sure, finding yourself in the middle of a storm at 4300 meters of altitude, in sub-zero temperatures, with hail hitting you hard, zero visibility, and not a place to hide is not my ideal excursion. On the other hand it was a very nice adventure, and I feel lucky for what I could experience.